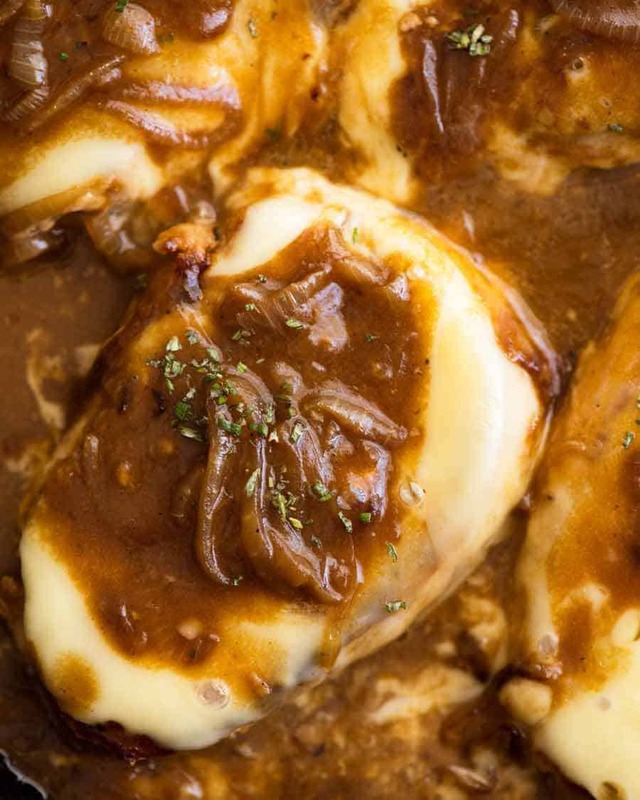 When French Onion Soup meets Smothered Pork Chops, very good things happen…. 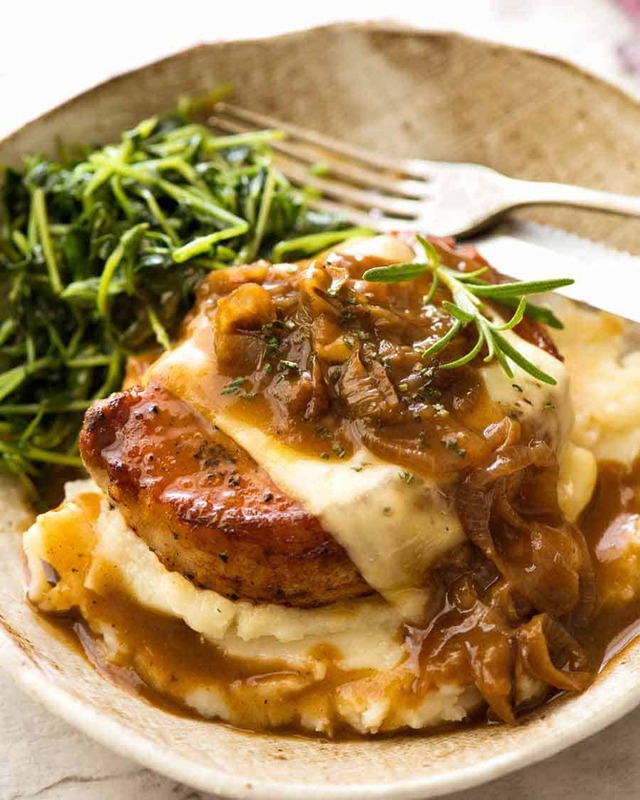 These juicy pan seared pork chops are served with an incredible French Onion gravy made with caramelised onions, then topped with melted cheese to complete the French Onion experience. Pork chop style! Whenever you see the word “smothered” in the context of food, you know you’re onto a good thing. 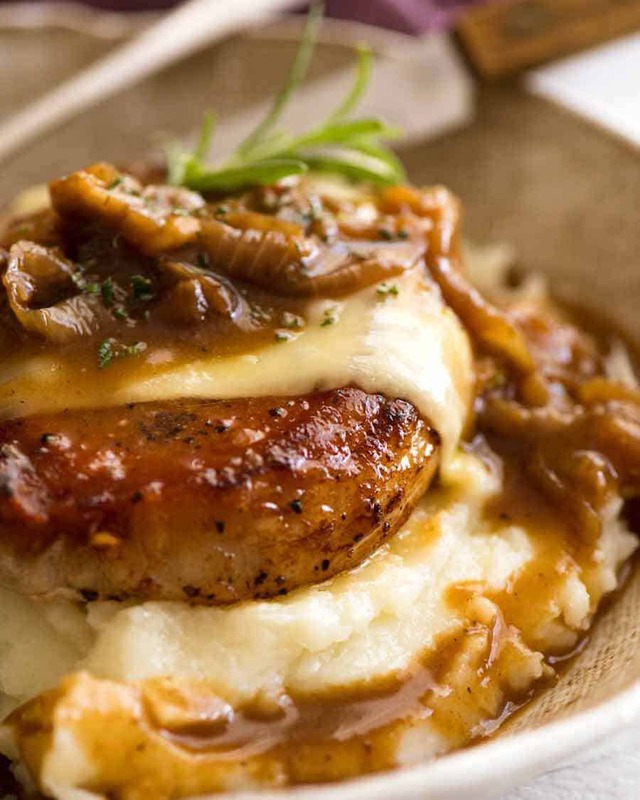 Whether it’s Chicken smothered in Mushroom Gravy, Steaks with Peppercorn Sauce, Salisbury Steak or Bangers and Mash with Onion Gravy, if it’s smothered then you know you’re in for a good meal. There’s a juicy pork chop under there. I promised you French Onion, and French Onion you shall get. So in true French Onion soup style, we’re starting with a base of caramelised onions. 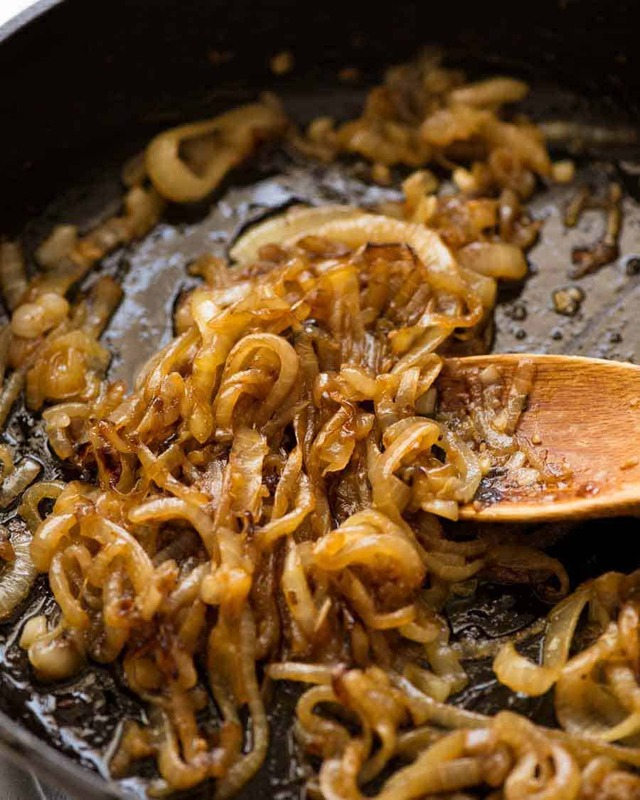 2 big onions, sliced into rounds then leisurely sautéed in butter for 15 minutes until they transform from a giant mound of eye-stinging raw onion into THIS: sweet, golden, caramelised onion. With no help from sugar at all! The caramelised onion makes such a fabulous flavour base, there’s very few other flavourings required for this French Onion Smothered Pork. Butter, garlic and onion for the Caramelised Onion. Simple seasonings for the chops – garlic powder (not critical), salt and pepper. Beef broth/stock and flour to make the French Onion Gravy. And the finishes touches: cheese to melt on top of the pork chops, and a little sprinkle of fresh rosemary. 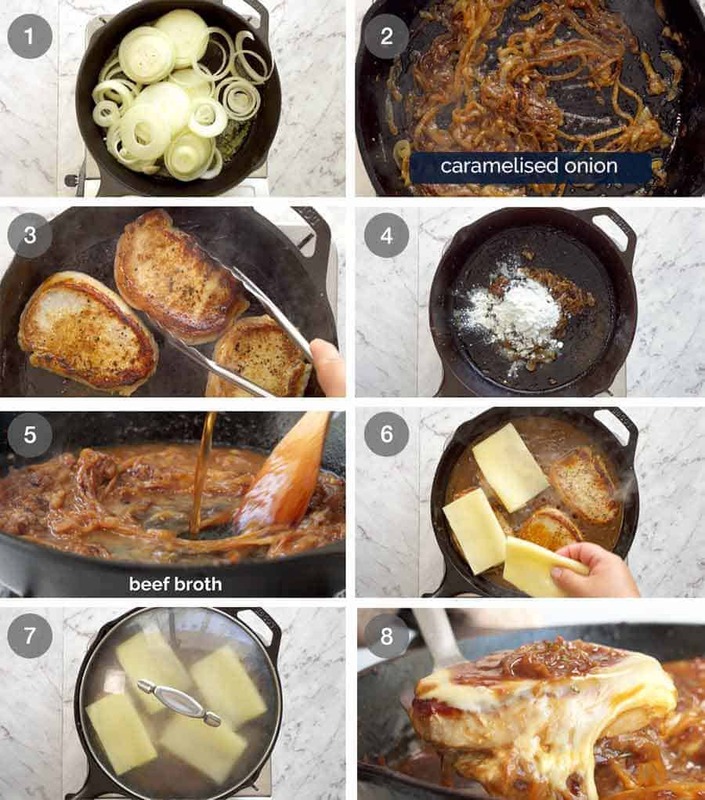 I like to make these French Onion Smothered Chops in one skillet. Not to save on washing up, because actually, using one skillet increases the overall cook time. One skillet means we don’t waste any flavour. Caramelise the onions first, then remove. 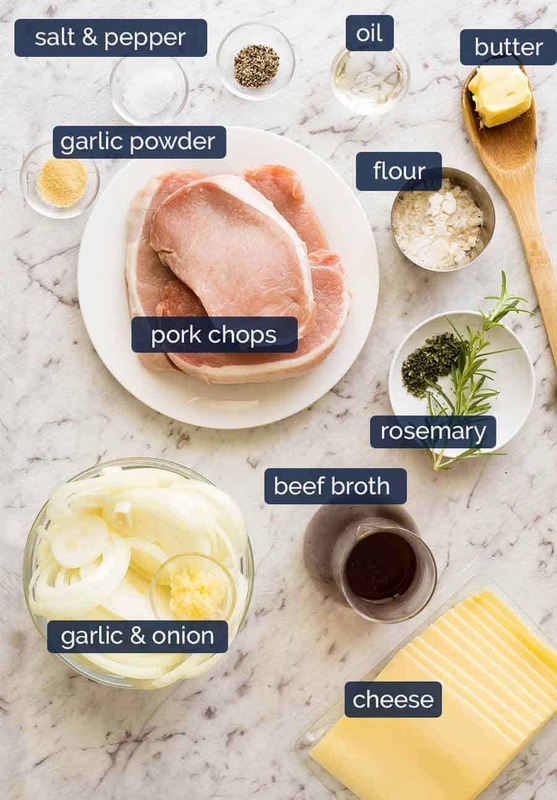 Use the residual fat in the skillet to sear the pork chops briefly – we want them raw on the inside to finish cooking later in the French Onion Gravy. Take the pork chops out then return the onion into the skillet to make the gravy. This way, our gravy also benefits from all those tasty brown bits left in the pan from searing the chops (called fond, if you want the technical term!). Then finally, we return the chops into the gravy to finish cooking. It’s a two-way flavour street here – the chops soak up those tasty gravy flavours, and the juices from the chops mingles into the gravy. PS Yes this can be made with chicken. Or beef, for that matter. Though It’d probably skip the cheese for beef. 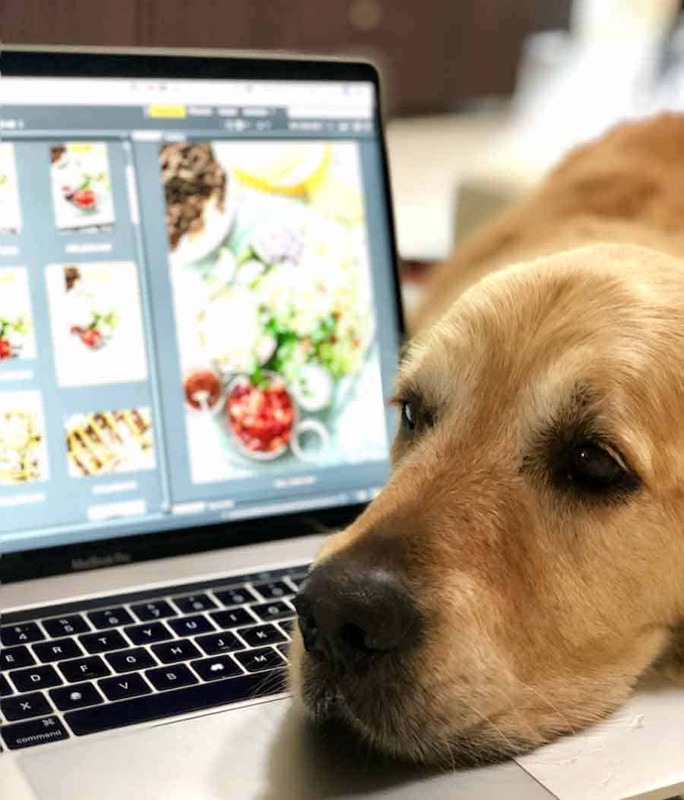 Recipe video above. French Onion Soup meets juicy pan seared pork! A gravy made with caramelised onion that tastes like your favourite French Onion soup. For the full French Onion experience, don’t skip the cheese! Make this with any type of pork chops you want – or chicken! Caramelise Onions: Melt butter on medium (or medium low for strong stoves). Add onion and garlic, cook 15 minutes until golden brown and caramelised, stirring regularly (see video). Remove from skillet. Prepare Chops: Sprinkle chops with garlic, salt and pepper. Sear: Add oil into skillet if needed. Turn heat up to high. Sear chops 1 minute on each side until nicely browned but not cooked inside. Remove onto plate. Gravy: Turn heat down to medium. Return onion into skillet, scraping in juices. Add flour, mix. Add beef broth and mix until incorporated. Season sauce to taste with salt and pepper. Add Chops: When it comes to a simmer, give it a big stir then add pork chops. Top with cheese, cook chops: Top with cheese, cover with lid to melt and finish cooking the chops through – only 2 minutes for thin chops like I’m using. Internal temp of 160F/70C for no pink (or 155F/68C for blush of pink). Garnish: Remove lid, sprinkle with rosemary. Spoon over French Onion Gravy, then sprinkle with more rosemary. Serve immediately, over mashed potato or similar. 1. Pork Chops – I used lean, boneless pork loin steaks about 1.5cm / 2/3″ thick. See note below for thick cut. 2. Cheese – Gruyere, Swiss, gouda or masdaam are ideal as these cheese don’t run everywhere when melted. Mozzarella also fine, but has less flavour that the others. Cheddar, Monterey Jack, tasty cheese and similar will also work just find but they might “bleed” a bit into the gravy (not a bad problem to have actually). * For a slight blush of pink: 155F/68C. I do this for tenderloin but not chops. 4. Thick Cut Pork Chops – cook longer, rest 5 minutes before serving. Increase the cook time in the gravy, adding water if required to adjust gravy thickness. Add the cheese towards end of cook time – only takes 1 minute to melt. 2.5cm/1″ bone-in chops will take about 5 minutes in the gravy, or until internal temperature is 155F/68C. Remove from sauce onto plate and cover loosely for 5 minutes. Internal temp will rise to 160F/70C. For blush of pink, take off stove when internal temperature is 150F/65C, after resting it will be 155F/68C. Inspired by this recipe video by Creme de la Crumb that was all over Facebook last year. How is one supposed to work under these conditions??!! 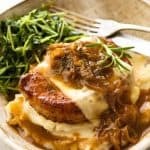 The post French Onion Smothered Pork Chops appeared first on RecipeTin Eats.